﻿ Do 68 Molecules Hold the Key to Understanding Disease? the Key to Understanding Disease? Why is it that the origins of many serious diseases remain a mystery? In considering that question, a scientist at the University of California, San Diego School of Medicine has come up with a unified molecular view of the indivisible unit of life, the cell, which may provide an answer. Click to view enlarged graphic. 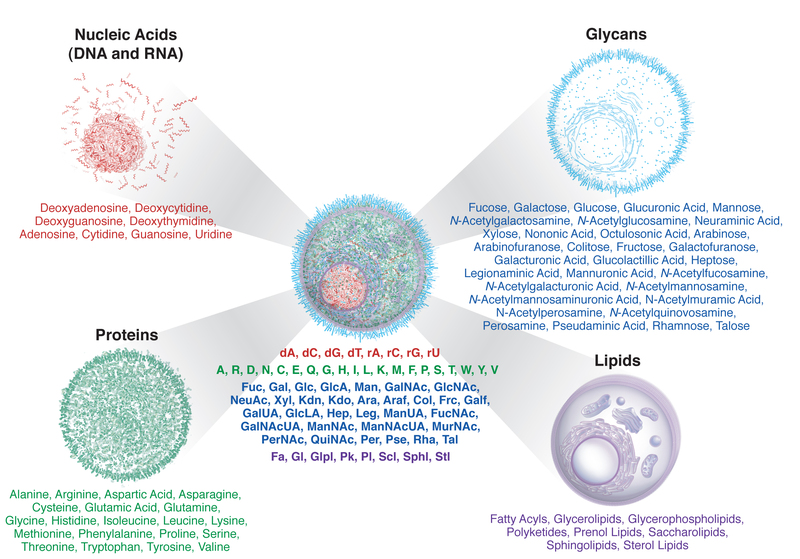 Reviewing findings from multiple disciplines, Jamey Marth, Ph.D., UC San Diego Professor of Cellular and Molecular Medicine and Investigator with the Howard Hughes Medical Institute, realized that only 68 molecular building blocks are used to construct these four fundamental components of cells: the nucleic acids (DNA and RNA), proteins, glycans and lipids. His work, which illustrates the primary composition of all cells, is published in the September issue of Nature Cell Biology. Like the periodic table of elements, first published in 1869 by Russian chemist Dmitri Mendeleev, is to chemistry, Marth’s visual metaphor offers a new framework for biologists. 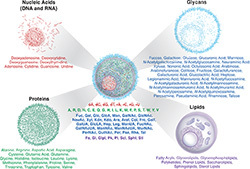 This new illustration defines the basic molecular building blocks of life and currently includes 32 glycans (sugar linkages found throughout the cell) and eight kinds of lipids (which compose cell membranes) along with the more well-known 20 amino acids that are used to make proteins and the eight nucleosides that compose the nucleic acids, DNA and RNA. Currently, the vast majority of medical research looks to the human genome and proteome for answers, but those answers remain elusive, and perhaps for good reason.